Leinster: East part of the island including counties Carlow, Dublin, Wexford, Wicklow, Louth, Kildare, Meath, Westmeath, Kilkenny, Laois, Offaly, Longford. 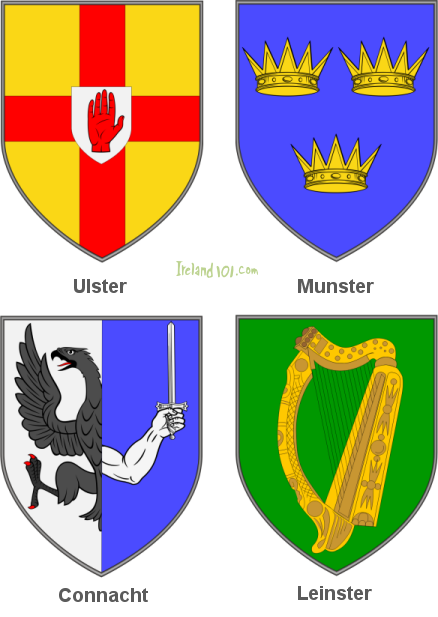 Munster: South part of the island including counties Clare, Cork, Kerry, Limerick, Tipperary, Waterford. 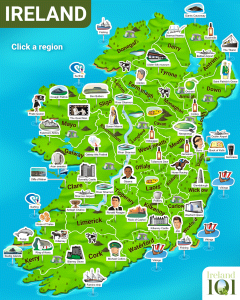 Connacht: West part of the island including counties Galway, Leitrim, Mayo, Roscommon, Sligo. 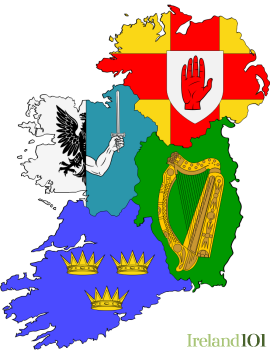 Ulster: North part of the island including counties Cavan, Donegal and Monaghan in the Republic of Ireland and counties Antrim, Armagh, Down, Derry, Fermanagh, Tyrone. Use the menu on the right, to read more about each county.